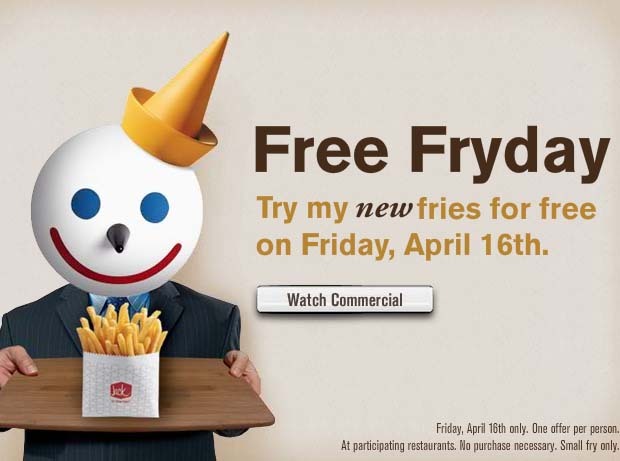 Get a free small fry at Jack in the Box on Friday, April 16. No coupon or purchase is required. I do recommend that you call your local Jack in the Box before heading out to confirm that they are participating in this promotion. They do say that Spokane, WA and Tulsa, OK are not participating. I'm glad that you said Spokane! I live a hop skip and a jump over stateline over in CdA Id! I wonder if it will be the same over here? Thanks again!